Note: Pictures referred to on this page are numbered #1 – #6 from top to bottom along the left side of this page. After my first time of slogging it thru 32″ wheel covering soup, I did the normal after-run cleanup and inspection. 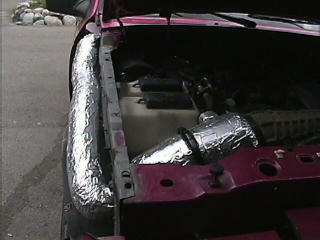 To my horror their was quite a bit of the liquid soup in my airbox! Now I know that engines are meant to run on air+gas not water+dirt. After cleaning the mess up I noticed that their is a “drain?” hole at the bottem of the box, but it was plugged up with crud, The hole was not big enough to have let in crud the size of the stuff that I had cleaned out. 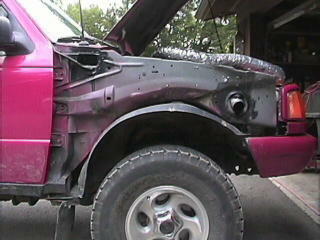 My next plan was to see just where the air pickup went to after it dissapears into the fender. Starting with Pic #6. you can see that little box didn’t even make it into my pics it was off that quick. 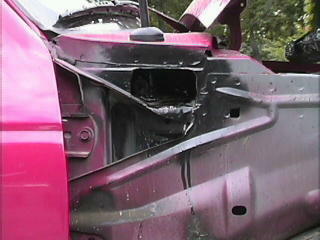 I have also opened up the hole in the cowl box, Pic #5 is a close up of that hole. I didn’t cut into either the engine or the passenger compartment, I simply opened up a drain hole that was already there by using a saw-zaw and a die grinder. A hammer bent the flange seam down so that it would not have to be cut and that no integerty was lost, I painted the area with a can of RustOleun so no rust will form later. I used a 3-Inch aluminun expandable dryer extension that I got from HomeDepot, I would of used a 2-1/4 to 2-3/8 tube if I could of found one that was flexible enough to make the bends it needs coming out of the box. 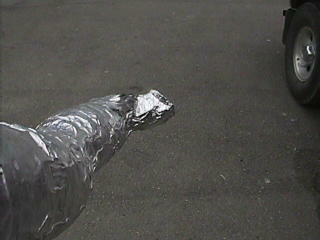 It is held on with stainless hose clamps and is wrapped in aluminun duct tape to give it some strength in order to hold it’s shape. In Pic #7 you can see that I formed the intake end with an upward bend so that any water that would get in the cowlbox won’t go down the tube, Pic #4 shows the intake mounted in the hole of the cowl. It doesnt need to be secured as the the pipe is formed pretty ridged and with the upward bend It holds itself pretty well. 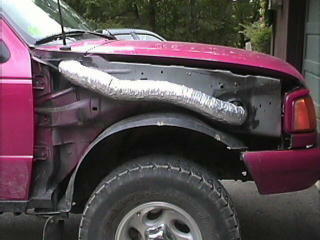 Make sure that water can get out and around the pipe or your cowl might fill up with water! Pic #2 & Pic #3 show it all finished. Many months and miles of both on and off road, I have had no problems. There was no loss of power out of my 4.0L. If anything, I think it picked some up. 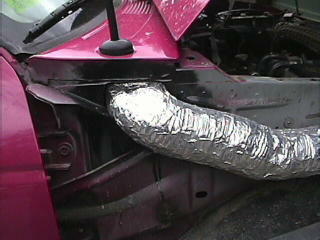 My thinking is this, ” I’ve seen cowl induction in NASCAR so it must work for them. If I open my vents but don’t turn on the fan fresh air still blows out of them, So it must have some positive pressure in the cowl box. If Ford thinks the cowl is a good dry place to draw air for the cabin then why not for the engine?” If you plan on going thru water deeper than your hood than all bets are off. Although, doesn’t Lund make a cowl shield? I have gone thru water up to the top of my wheelwells and have not found a single drop of water in the intake. One, I didn’t even think of this but when I test drove this for the first time it sounded great!!!! Three, If this can save only 1 person the pain of a drowned and hydrolocked engine then all of this typing was worth it!